Aaron’s love for music is undeniable. 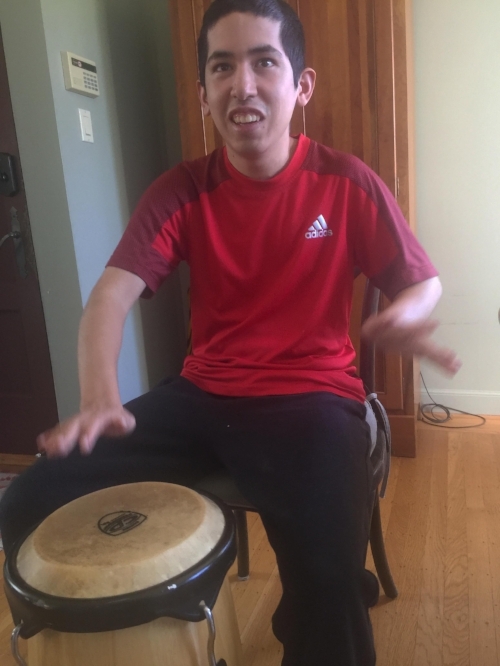 At the age of eleven, his teacher noticed a natural ability to move to the beat of his favorite songs. He turned and jumped as his classmates clapped and cheered him on. His smile exhibited pure joy. Teacher Alex, was moved by his love for dance, and invited him to join a musical production at a local theater. This was Aaron’s introduction to the stage and a to a live audience. I didn’t know what to expect from him, as usual, he surprised me. During seven consecutive Saturdays he shared a studio space with ten other young people and became part of a production crew who rehearsed skits and songs that resulted in a performance in the Hillbarn Theater in Foster City, California. Musical skits from the production, Free To Be You and Me, written by Marlo Thomas made up the ninety minute musical. The performers, ranging in ages from nine to fifteen, were joined by peers who supported those who needed guidance in performing their parts. Kate, a fifteen-year-old actress, became Aaron’s acting buddy. During the performance Aaron appeared nervous, until the applause filled the room and his face lit up. The smile lingered throughout the evening and widened when he joined hands with his fellow actors and took a final bow. The joyful expression in his face stayed with me. My plan was to enroll him in the next production the following summer, but unexpected events made it impossible. My heart broke when, the following year, Aaron became one of the 30% of individuals with autism who suffer from seizure disorders. Although some children experience convulsions at an early age; most common are those that have an onset during the puberty years. Aaron’s teen years were stressful for his body and for our family. For eight years we sought help from neurologists who could help lessen the onset of recurring seizures. Visits to the emergency room and behavior challenges filled many days and nights. After experimenting with several medications without seeing an acceptable reduction in seizures, a progressive neurologist suggested that we try to surgically implant a device, very similar to a pace maker, called Vagus Nerve Stimulator (VNS). Although the VNS did not decrease the frequency of seizures it did improve his mood. Weekly seizures continued to drain his energy. In 2015, two remarkable events changed the course of our lives. In May Aaron began to take small doses of Cannabis oil. After a year of consistent dosing we have begun to see a reduction in seizures and most importantly, a much happier and energetic young man. As an added bonus, later that same year, I met Elaine Hall an acting coach, whose son Neil is also a music lover. We share the dream of brining opportunities to our sons to be seen on the stage and share their talents with others. Elaine is the creator of The Miracle Project®, a drama and acting program that promotes the talents of young people with different abilities. Her program allows them to shine on stage. At the age of twenty-four, Aaron will have another chance to be part of a theater production. He will be one of six participants in the pilot program scheduled for August 2017. His natural love to move and express himself with music will continue in a production that will be called “What’s Next?”.